The Clash at Clairemont began in 2007 as a cooperative effort between Pro Skateboarder Andy Macdonald, the Mission Valley YMCA / Krause Family Skate and Bike Park, Grind for Life and Industry Sponsors like Pacsun and SoBe beverages. The first year’s event unveiled the new Vert Ramp (The 2006 X-games Vert ramp re-constructed on the grounds of the YMCA skatepark). The event, a celebration of the newly acquired ramp and park renovations was an opportunity to create a fundraiser that benefits the Mission Valley/Krause Family Bike and Skatepark and the Grind for Life Cancer charity. The event featuring over 35 of today’s best Action Sports athletes, live music and family fun was a huge success! 2008-2010 The Clash at Clairemont II-IV returned with resounding success. With the very best athletes from skateboarding and BMX along with terrific musical acts and industry sponsor support a classic annual event was born. Media attention and attendance skyrocketed and now the Clash at Clairemont has cemented its first class reputation as a terrific family oriented celebration of Action Sports and charitable cause! 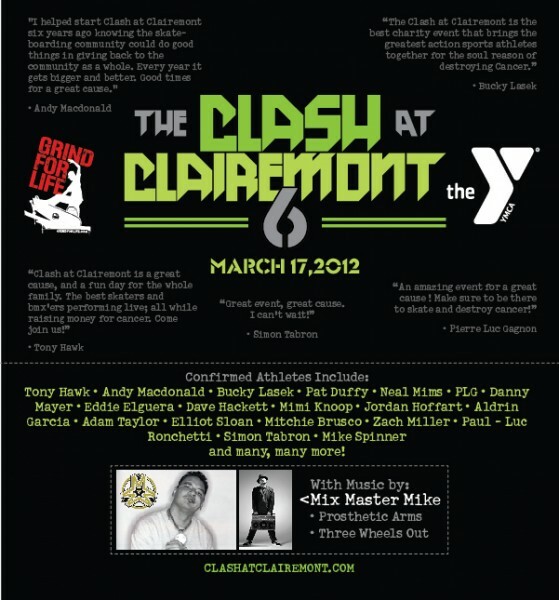 And now Clash At Clairemont is entering its sixth year!